This ticket is for the 7pm performance of Mystere in Category 1 Seating. Click here to view the seating plan. This ticket is for the 7pm performance of Mystere in Category 2 Seating. This ticket is for the 7pm performance of Mystere in Category 3 Seating. This ticket is for the 9:30pm performance of Mystere in Category 1 Seating. This ticket is for the 9:30pm performance of Mystere in Category 2 Seating. This ticket is for the 9:30pm performance of Mystere in Category 3 Seating. If you are booking more than one date or show, then you must make a separate booking for each performance. Failure to do this may result in non-confirmation of one or both reservations. All theatre bookings are 100% non-refundable once booked. When booking please make sure you're aware that there are restricted view seats available. This is usually shown on the rate next to the section as RV. 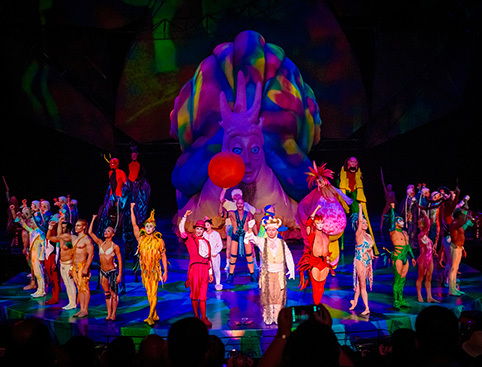 Mystère is a classic Cirque du Soleil show, filled with whimsy and excitement. The audience follows the characters as they try to understand the mysteries of life, from the first organisms to the present day. But this is no educational lecture; the characters are all skilled acrobats who put on a spellbinding show stuffed with amazement and unbelievable athletic feats. You’ll see daring acts performed in mid-air, powerful tricks and jumps and incredible costumes, all set to the beautiful taiko music that Cirque du Soleil have composed. 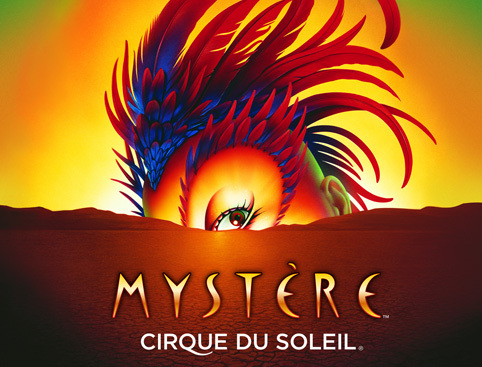 As one of the original Cirque du Soleil shows, tickets to Mystère are highly sought-after. Book early to secure the date you want! To view the seating plan, please click here. This show is approx 90 minutes. 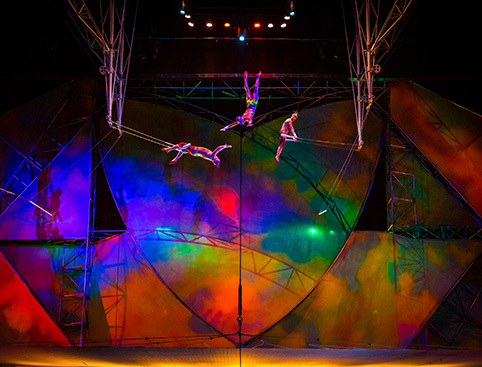 This show starts at 7:00 p.m. and 9:30 p.m.
Children of any age are allowed to enjoy this show and under 2's go FREE with a paid adult and would have to sit on their lap. If children become disruptive during the show, you may be asked to leave without refund. When booking please make sure you're aware that there are restricted seats available. This is usually shown on the rate next to the section as RV. All theatre bookings are 100% non-refundable once booked.